The year marks the 30th Anniversary of Temple Bar Gallery + Studios. To celebrate the occasion, the gallery are hosting a number of events, talks and exhibitions. 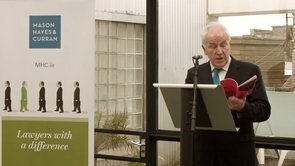 We were asked along to the launch of the programme which was attended by Minister for Arts Heritage and Gaeltacht, Jimmy Deenihan, and Declan Moylan from Mason Hayes & Curran; TBG+S current corporate sponsor. They spoke about the cultural significance and heritage of TBG+S and praised it’s ambition and prolificacy.